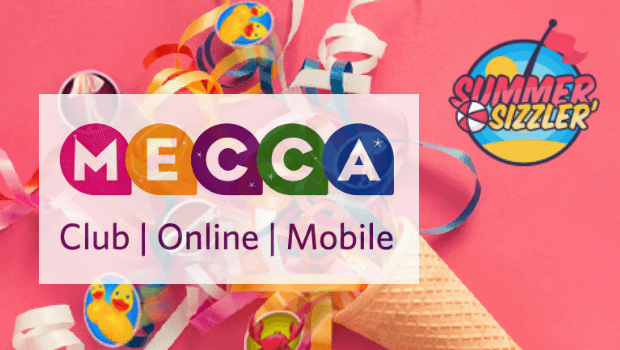 It’s the time of summer promotions in the world of online gambling – and Mecca Bingo is the latest brand to get in on the act with its Summer Sizzler giveaway. Over 12,000 prizes are up for grabs, worth a total of £6 million, with one lucky winner scooping the top prize of £1,000. Every participant will be entered into a prize draw to snag a very hot £30,000 to boot! Opting into the promotion is straightforward. First, players must have an online account with Mecca Bingo, as this promotion is only available via the web and not at Mecca Bingo clubs. For new customers, signing up is easy and requires just a few personal details. To take part, customers need to enter the promotional code SIZZLER in the ‘My Bonuses’ section of their account. Every £30 deposited and spent on the site will also equal one entry into the prize draw to win £30,000. There’s no limit on the number of times players can enter the promotion, as long as the £30 is spent before the end of the promotional period. Game bonuses and bingo bonuses are subject to wagering requirements. You can read the full terms and conditions of the promo on the Mecca Bingo website. After making the £30 deposit, it’s a case of choosing which of the hundreds of games on offer to spend the money on. As well as bingo rooms (think Britain’s Got Talent Bingo, Rainbow Riches Bingo and Turbo 90), players can access around 300 online slots, including popular titles like Wizard of Oz: Road to Emerald City and Starburst. There are also several scratchcards, jackpots and instant win games on offer, so there’s a lot more to Mecca Bingo than just bingo. All games are available to play on desktop, tablet and smartphone. With visitor numbers dropping at brick-and-mortar casino halls, Mecca Bingo is clearly trying to boost its iGaming offering with a selection of slots to rival the major online casino providers. Mecca’s Summer Sizzler is not the only bingo-related promotion around this summer. Paddy Power’s Bingo Summer Bargain, offering discounted games and enhanced prizes in the Gold Room, ends this weekend. The Irish bookmaker is dishing out £2.4 million in prizes to bingo players. Also ending soon is bet365’s Codebreaker promotion. To enter this, punters have to play in one of five bingo rooms. Each week a new code will be revealed and players have to match one, two, three or four numbers of the code to unlock a prize. Players can get their hands on a share of £250 in cash and the more numbers you match the bigger the prize will be. Sadly, summer is coming to an end so bingo players don’t have long to enter these promotions. So sign up with Mecca Bingo today to deposit and spend £30 before 3 September to be in with a chance of entering the Summer Sizzler. Grab it while it’s hot!